Dispenser boxes are manufactured from high quality cardboard and pre-glued, ready for easy assembly. These products are perfect for storing labels in them, as shown in the picture, but can be used for many other things too! Insert rolls of ribbon in them and you have a handy and tidy way to store and measure out the lengths from. 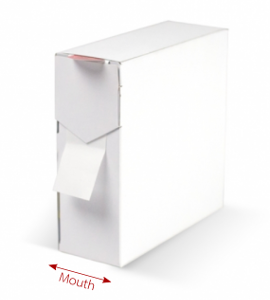 Dispenser boxes come in many different shapes and sizes, with simple construction methods, these boxes are brilliant in cutting down your packaging time and result in a tidy way to send or store your rolls of labels. Sizes available as below (middle measurement indicates the width of the "mouth"of the box). 99mm x 82mm x 102mm. 89mm x 25mm x 89mm.